Midfielder Jo Love says nothing less than six points will be enough to give Scotland a positive start to their World Cup qualifying campaign. The Scots begin their Group 2 campaign away to Belarus on Thursday before hosting Albania five days later. 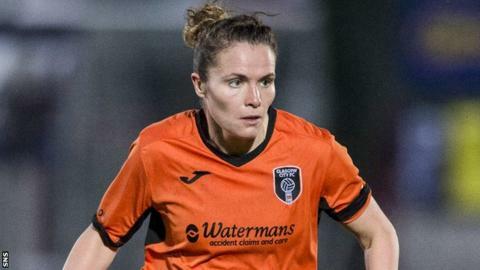 "We are hopefully going to get the six points," said Glasgow City's Love. "Anything less than that for us, we're going to put ourselves in a not-so-positive situation to push on for the rest of the group." Scotland's four group rivals have all played twice already, with Switzerland off to a flyer after wins over Poland and Albania. "Obviously some of the teams in our group have already had a game, so this is the big one for us," Love told BBC Scotland. "I think this is going to be the one that hopefully puts the marker down and then we can push on through this campaign." It will be Scotland's first competitive fixture under new manager Shelley Kerr, who took over from Anna Signeul after this summer's Euro 2017 finals. And Love, who earned the first of her 181 caps at the age of 15 when Kerr was also in the national team, is beginning to see evidence of the greater attacking intent promised by the former Arsenal defender. "We have certainly seen that on the training ground - Shelley is always trying to make us be positive and go forward a lot quicker," said Love, who scored the only goal in Scotland's last visit to Minsk in a June 2016 Euro qualifier. "But I think we can only do that now because Anna set us in good stead defensively and we have a good base to allow us to be more attacking. "It has not been too different, which has been a good thing for the girls. We have not had too much to adapt to." Kerr has only had one game in charge - a 3-0 friendly victory away to Hungary - since the Scots failed to qualify from their group at the finals in Netherlands. "Just playing on that stage and being in front of the crowd and the whole hype surrounding the Euros was great," added Love. "I imagine you would multiply that by a few if you reach the World Cup. "We are always looking to improve, so we're definitely going to try to kick on and get us off to a good start. "It did just whet the appetite. If I wasn't looking to make these World Cup play-offs then I really don't know why I would be here just now." Kerr paid tribute the Love's influence on the team. "It is quite phenomenal," she said. "I experienced Jo coming into the team as a 15-year-old in her first cap against Canada and she's a player that goes about her business professionally. "She is an absolute role model and is still going strong. I said against Hungary that it was one of the best performances that I have seen Jo play for a long time."